You may withdraw your consent at any time by following the unsubscribe link located at the bottom of all Ann's Bridal Bargain emails. Wedding response cards, also known as RSVP cards, are an important part of your invitation ensemble but they can also be a burden on your budget. 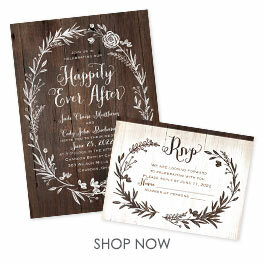 Many of our discount wedding invitations are available with matching wedding response card for a very affordable price. You can also choose to purchase just wedding response cards to complement a wedding invitation you already have picked out or purchased. Check out our selection of response postcards for another affordable option that will complement your wedding stationery beautifully. Response postcards require less postage and are super simple to use. All you have to do is add postage. Guests simply fill out the card and drop them in the mail. Response postcards come in a variety of designs as well, so you can create an affordable and stylish invitation ensemble with coordinating response cards for wedding. You may withdraw your consent at any time by following the unsubscribe link located at the bottom of all Ann's Bridal Bargains emails. Ann's Bridal Bargains ships to the United States and Canada. Prices on our site are listed in US Dollars. © 2019 Ann's Bridal Bargains All Rights Reserved Worldwide.